In our Haworth workshop. Hand stitched veg tanned leather, hand dyed in a choice of colours and a variety of styles for dancers or every day wear. 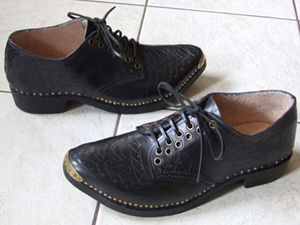 Farmers clogs treadle stitched chrome leather with sewn in tongue in black or brown. 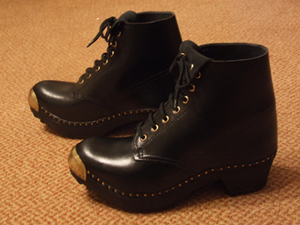 Walking boot style, hand stitched in veg tan leather, individually coloured. The soles are sycamore or ash, shaped to the foot and can have an extra flat or raised sole tops for feet with special requirements. To make an appointment for a fitting or to enquire about our clog making and demonstration for agricultural shows, festivals and craft events, please contact Robin Shepherd.